Million Air Mechanical is an "A+"
Are you having problems with your HEATING system? At Million Air Mechanical, we have experience repairing all types of HVAC equipment including furnaces, water heaters, boilers, baseboard heaters, duct-work, thermostats and heat pumps. If your HVAC equipment is not running properly, chances are we can fix it! Contact us today to schedule your heating repair (303) 568-3709. Your furnace is the heat source for your home making it the most important pieces in your heating system. There are several things that could go wrong with your furnace that can lead to inefficiency, malfunction or damage to it's parts. Regardless the fuel source, we can repair your furnace and get it running properly. The majority of our heating services deal with residential furnace repairs in Denver, CO. Your heat pump is responsible for moving your heat from one area to another. It is important to know your heat pump is working properly to maintain your home's comfort levels in the winter. If you are having problems with heating certain rooms of your home your heat pump may need to be repairs or replaced. Your thermostat is the device that controls the temperature of the rooms in your home. It is responsible for turning your furnace and air conditioning systems on and off depending on the temperature it is set to. 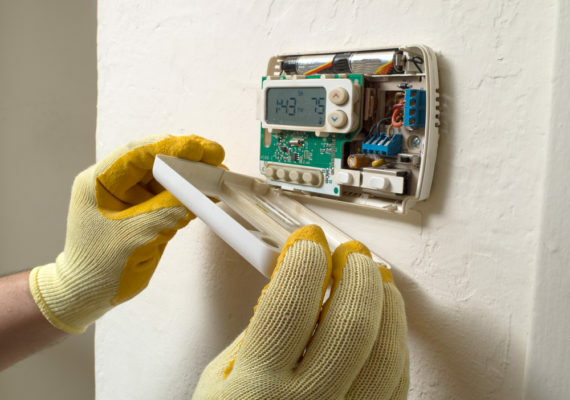 There can be many issues with thermostats that can cause you to spend more on your utilities than necessary. If you need your thermostat to be repaired or you would just like someone to evaluate your current thermostat's performance, we can help you find a good solution for your heating and air conditioning needs. Your boiler system is responsible for delivering your heater water or steam to different parts throughout your home for a heating source. We can inspect and repair your boiler, your heat source and the piping throughout your home to ensure you home is properly heated. Since the beginning, we have repaired boilers in Denver, CO and truly are the experts. Simply fill out the form below and we will get back with you immediately. Please fill out the heating service form below and someone from our company will contact your shortly. © Copyright 2018 by SEOhog. All rights reserved.